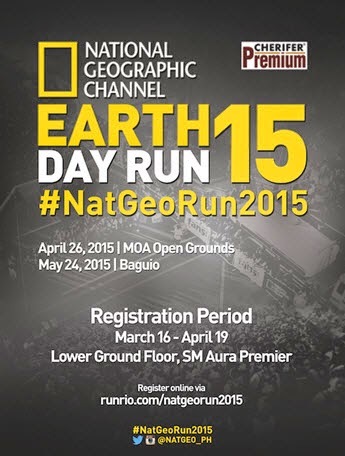 Earth Day Run 2015, powered by National Geographic Channel (NGC), will be introducing new and exciting changes to mark its sixth year as one of the biggest running events in the Philippines. With RunRio at the helm, Earth Day Run 2015 is expecting 20,000 runners to participate on April 26, 2015 at the Mall of Asia Open Grounds, with the addition of 5,000 runners for its Baguio leg. Support from the registration of all participants will help raise money for portable solar powered lighting kits that will be sent to communities in Mindoro, a project of NGC’s environmental partner, World Wildlife Fund for Nature. These portable solar powered lighting kits will provide light and electricity to the Tawbuid Mangyan tribesfolk and Forest Rangers’ camps that are not directly connected to power grids. The lighting kits eliminate the use of highly-flammable kerosene to light up their homes and gives them access to a safe, stable and sustainable energy source that gives more opportunities for community development and advancement. NGC’s Earth Day Run has consistently helped in promoting sustainable living and supporting environmental advocacy utilizing the popular platform of running in its six years of operation. As a result, participation in Earth Day Run has increased year on year, allowing NGC to contribute significantly to various environmental causes. Earth Day Run 2015 expects to register 20,000 runners this year, and slots for 5K, 10K, 21K and 42K (Manila leg only) will be open beginning February 23,2015, via online registration at www.runrio.com. On-site registration starts March 16 to April 19 at the Lower Ground Floor, SM Aura Premier BGC. NGC, together with its partners, aims to raise awareness on the benefits of sustainable energy while ensuring that the events at Earth Day Run 2015 will involve fun celebrations that include races, awards and shows of skill. Besides providing recreation and fitness benefits through Earth Day Run 2015, NGC will also be partnering with its participants to make substantial contributions to the sustainable development of the Tawbuid Mangyan tribesfolk and to provide support to the Mindoro Forest Rangers advocating the preservation of our Tamaraws.